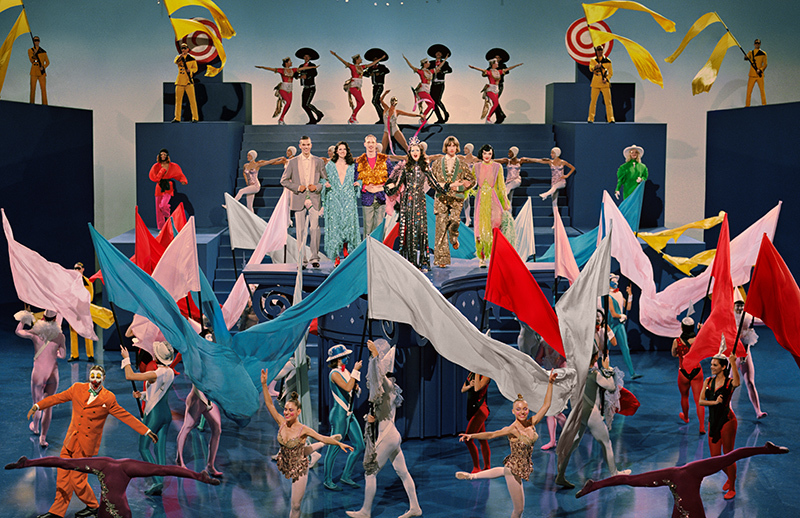 Presenting Gucci Spring/Summer 2019 Campaign is an homage to the golden age of Hollywood musicals. An homage to the beginnings of celebrity culture and the golden age of Hollywood musicals, #GucciShowtime focuses on the joyful and playful spirit of the era. The campaign mimic some of the greatest movies of all times including ‘There’s No Business Like Show Business’ the 1954, 20th Century-Fox musical-comedy-drama. In gowns with long shimmering beads and sequin suits from #GucciSS19 by #AlessandroMichele, characters from the #GucciShowtime campaign impersonate famed musical stars from the 40s and 50s. A film directed by @_glen_luchford, #GucciShowtime stars a cast of characters tap dancing and performing in sync in various glitzy sets including grand theatre stages and surreal dreamscapes. A legendary scene from the 1953 ‘Gentlemen Prefer Blondes’ musical inspires an image from #GucciShowtime featuring a light taffetà V-neck dress with puff sleeves and sculpted plissé details from #GucciSS19 by #AlessandroMichele. An imaginative and nostalgic reinterpretation of Hollywood musicals in the 40s and 50s, a theatrical image from #GucciShowtime shot by @_glen_luchfordfeatures a tulle dress with detachable hood and all-over contrast sequin and bead fringe details from #GucciSS19. Recalling black and white publicity stills created by the cinema studios to promote their stars in the 30s and 40s. Dramatic lighting in the style of the many famous movie star portraits during Hollywood’s golden era features in portraits.